There is an earlier post I have put up for Sathu Maavu Ganji Recipe (Multi-cereal Health Mix porridge). This post is related to that…. After I started making this porridge powder for my son, I realized that I was getting some things into my pantry like Jowar, Bajra etc which I would not normally use otherwise. The issue is that I do not get very small quantities of this at my grocery store and I land up with a lot of it being left over after I prepare the porridge powder. So I decided to start making a very healthy Thalipeet powder. 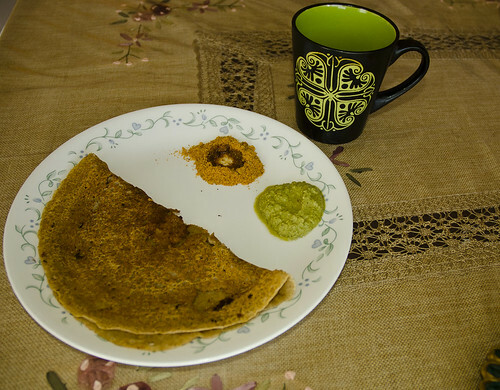 Thalipeet is a popular Maharashtrian dish and is made out of a flour called Bhajani which is a multi-grain powder. Similar to what I did with the Ganji powder, I decided to sprout the cereals in this recipe too. It is extremely nutritious, flavourful and tasty too! Raagi, Bajra, Jowar – Wash each separately in water and soak for 2 days and tie in muslin cloth for 2 days in a dark place for sprouting. Then dry in shade till completely dry. Green gram(Moong) – Wash in water and soak for 1 days and tie in muslin cloth for 1 days in a dark place for sprouting. Then dry in shade till completely dry. Red rice, Wheat – wash and dry in shade till completely dry. Rest of the ingredients use as-is. – Mildly Dry roast all of the above ingredients one by one. – Mix all the ingredients and blend into a fine powder – if you are in India, you can do this in the flour mill. Once powdered, your Bhajani powder is ready. If stored in an airtight container in a dry place, this can be kept for 3 months. – Divide the dough into small balls (like you do for chappathis). -Place this on a banana leaf/plastic sheet/butter paper smeared with some oil. – Using your hand, pat it to make round flat breads (use water so that it does not stick to your hand). This is similar to what you would do for Akki roti/raagi roti. – Transfer this to a heated tava and roast on both sides with a little oil. (If you try to skip the oil, it would be too dry.). The thinner you have made it the crispier it will be! 1) Note that these will not be easy to roll and transfer like the chappathi dough as the dough will not be too elastic. You can use some wheat flour for dusting. 2) To make the dough easier to work with, you can add some wheat flour while kneading it. 3) This Bhajani flour can also be mixed with dosa batter. 4) Serve it with some yoghurt, pickle, chutney or any other side dish of your choice. 5) You can add vegetables (grated carrots, mooli, boiled mashed potatoes) as required like you do for parathas. 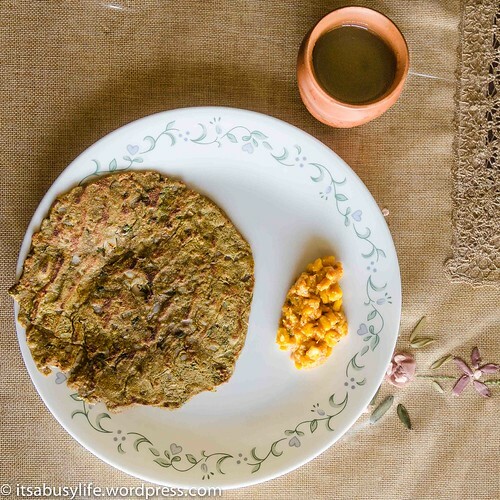 IMPORTANT – Keeping the Bhajani flour for too long gives it a bitter taste! Eat it hot as it is best-tasting directly out of the tava 🙂 Great for a nice heavy breakfast/sunday brunch! Try this and let me know how it turns out…. This is not really a recipe as there is no cooking involved in this but I am just listing the ingredients that go into Til Gul (Ellu Bella).Til is Sesame seed and Gul is Jaggery. This is traditionally made on the occasion of Sankranthi. Til Gul is distributed to all saying ‘Til Gul Gya Goda Goda Bol’ – meaning, ‘Have Til Gul and Speak sweetly’! 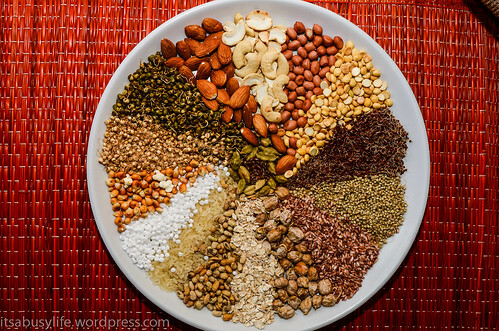 – Mix all the above along with the copra pieces, sugar coated jeera and mishri. Til Gul is ready for Sankaranthi. You can put them in covers/small boxes for distribution. Do you try to minimize the plastic bags at home and go green but always accumulate so many of them at home? Well, I have the same problem at home! I feel if we cannot totally get rid of them, One way to go green is to at least reuse them. 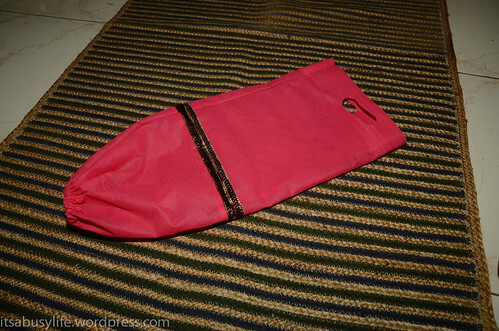 So I made a plastic bag dispenser for myself about a year back – a simple one by up-cycling a bag that someone had given me. I use it regularly and I have found it really useful. 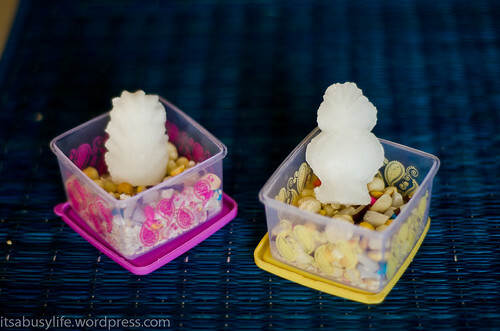 So this year for Navarathri, I decided to make a few of these for the return gift with the Thamboolam (Usually when people visit for Golu, we give beetel leaf, coconut, along with a small gift). It is very common for people to give articles like plastic boxes or small steel bowls or baskets but nowadays people are innovative and thing of different kind of useful items to give as gifts. I paired the bags and for each pair – From one bag, cut the top portion (handle) and bottom portion – Bag A. From the other bag, cut the bottom portion alone – Bag B. Then I stitched some decorative lace on the one with the bottom portion cut (on Bag B). 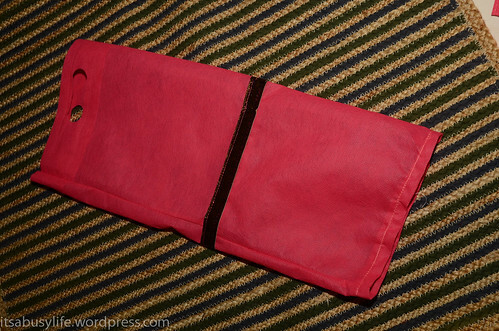 For Bag B, I ,made a small cut in the center of one side, folded the bottom end and stitched it. Put an elastic through this – the cut is to allow the elastic to go through. 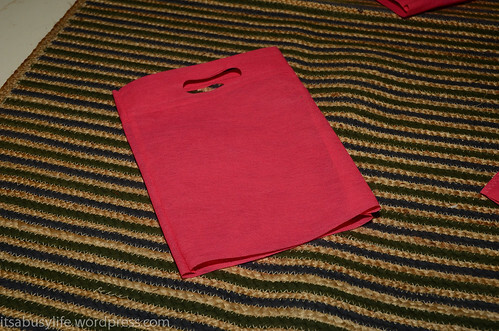 Then stitched the two pieces together as shown – Bag B in the top and Bag A in the bottom. Since the bags I used were reversible, I reversed it before using it as I did not like the seam showing outside. Hang this using a S-hook wherever you need and manage the plastic cover mess in your house :)! With Uttana Dwadasi around the corner, I thought it is a good time to post the details of this pooja (with pictures from last year) as it might be helpful to some of you. Karthika shukla paksha dwadasi is known as Uttana dwadasi. ‘Uttana’ means getting up from sleep. It is believed that God sleeps for 4 months during Chaturmasa and is getting up on Uttana Dwadasi day. This generally falls in Oct/Nov.Uttana Dwadasi is celebrated as the Tulasi Vivaaha day – The day when Tulasi got married to Lord Krishna (Vishnu). Tulasi (Basil) plant is considered very sacred and is also known for its medicinal properties. It can be found in almost all the households and ladies water and do pooja for the Tulasi plant daily. This Pooja is a very important festival for Madhwas and is celebrated in a grand manner. Significance of the Amla plant – In Karthika Month, it is believed that God Vishnu exists in the Amla plant in the name of Damodara. Hence this is used in this function. Tulsi/Goddess face with a small black beads mangalsutra – if you have this. Picture or idol of Krishna to place along with Tulasi. 1) This Utwan Dwadasi pooja is usually done in the evenings (I love that it is in the evenings – morning poojas before office is really stressful :)!). 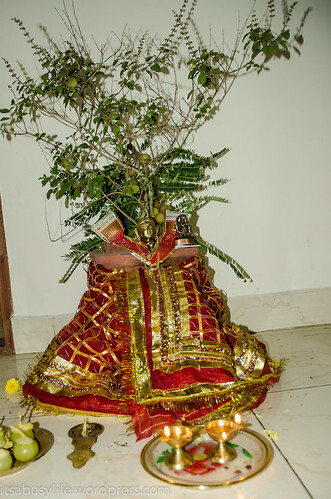 2) You can place the Tulasi plant in the house where you want to do the pooja after putting a small rangoli and also keep a twig from the Amla plant in it. 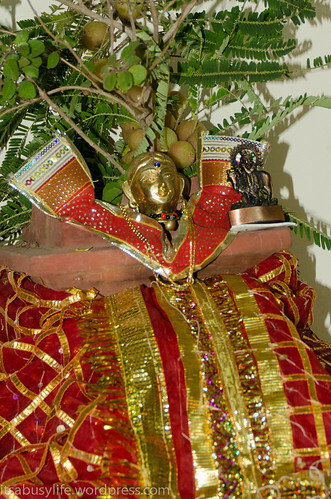 3) Decorate the Tulasi plant as you like and keep a picture or idol of Krishna along with Tulasi. 4) Light lamps and agarbathi (incense stick) for the Goddess. 6) Put Haldi, Kumkum, Mantarakshatha, Vastra, flowers and do Pooja. You can tell Tulasi slokas if you know this. I have included Tulasi Archana Sloka below. The archana can be done with flowers or with kumkum. 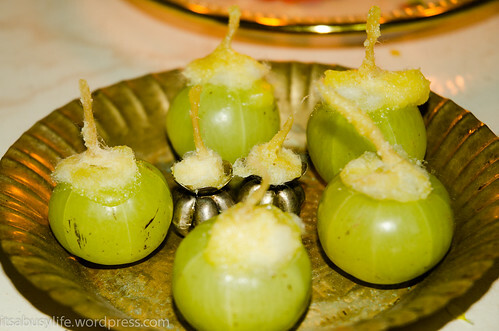 7) Light the amla lamps and do aarathi for Tulasi and Krishna. 9) Do Namaskara and pray to Tulasi for a good life! 10) Many more lamps can also be lit outside and around the house. Kids also enjoy fireworks on this day. 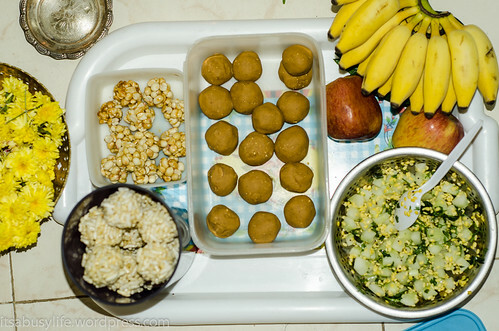 11)Vida/Thamboolam can be given to Sumangalis along with Kosambari and Laddoos. 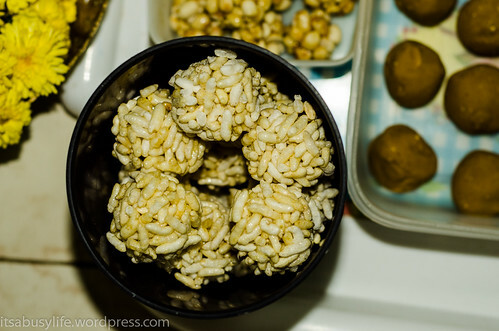 Apart from preparing the typical festival food, for Uttana Dwadasi specifically Laddoos are made with different items like Pori (puffed rice), Pottu kadalai (fried gram), groundnuts etc. In this post I am writing the recipe for a healthy Multi-cereal porridge. I try to give this to my son on a daily basis but this can be consumed by adults as well. There are a lot of ready-made versions of this available in stores (in India) but as far as I have noticed none of them contain as many ingredients as I like to include in it. You also have the flexibility to omit a few ingredients if you prepare this at home. 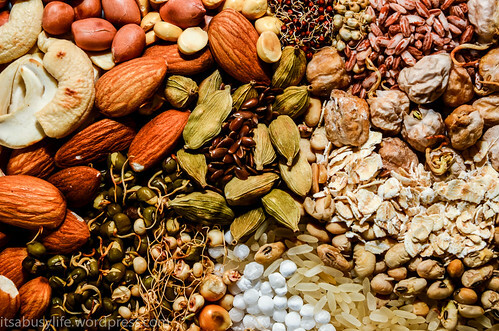 I also like to sprout most of the cereals/pulses as I feel it makes it healthier – this is also not done in most of the store-bought ones. 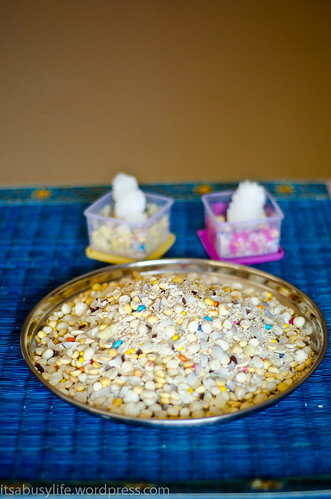 Green gram(Moong), Soyabean, Channa – Wash each separately in water and soak for 1 days and tie in muslin cloth for 1 days in a dark place for sprouting. Then dry in shade till completely dry. 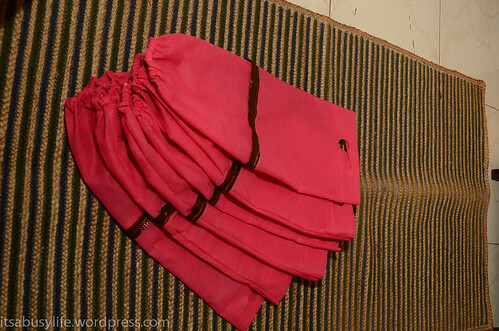 Red rice, Boiled rice (puzhungal arisi), Wheat – wash and dry in shade till completely dry. Rest of the ingredients use as is. Once powdered, your Sathu Maavu Ganji powder is ready. If stored in an airtight container in a dry place, this can be kept for 3 months. The porridge can be made by dissolving 2 tbsp of this powder in some water. Then add to this glass of milk/water and cook on low flame stirring continuously. Depending on how thick you want your porridge you can vary the amount of porridge mix and the water/milk. Sugar can be added to taste and you can even add a few raisins if you like. If you would like to have a salty version of the porridge cook the porridge as mentioned above in water, cool it and then add some buttermilk, salt, asafoetida (hing). However for this you might want to leave out the cardamom from the powder as it might not suit the salty version. – The quantities I have mentioned will yield a lot of powder – so if you are not going to make it regularly please reduce the quantities proportionately. – I started making this for my son from when he was 2 years old but if you want to give it to younger kids, check with your doctor first. – If you plan on making the salty version, leave out the cardamom. This is a short post… Its been a while since I have updated the blog, so just wanted to share this. During Navarthri, I had to use his shelf for the Golu steps (Check my earlier post for more details on it). So I had to remove all his toys and books from it. 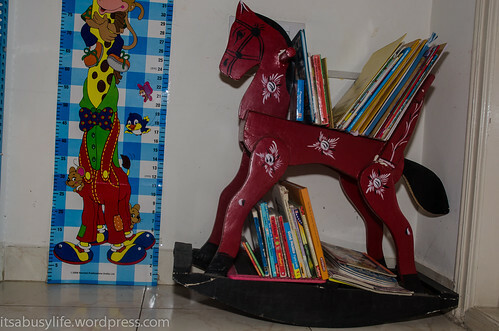 There was a wooden rocking horse that his grandfather gifted him for his 1st birthday and now he has outgrown it. But it is so cute that I have not had the heart to dispose it. When I had to move his toys and books, I suddenly had an idea that I could use it as a bookshelf temporarily. 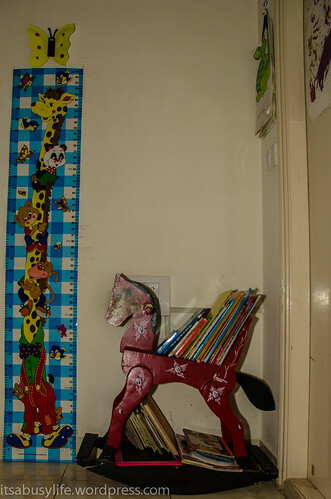 Now I am continuing to use it as a bookshelf for my son in his room and he loves it :)! Isn’t it rocking indeed ?! 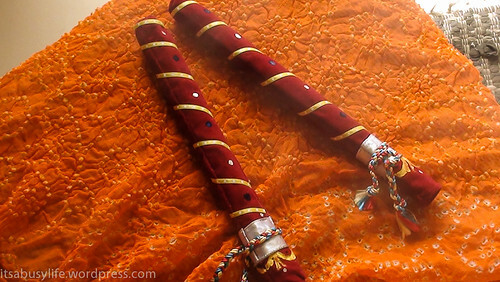 With Dusshera around the corner, I know a lot of you will be busy with Dandiya 🙂 In my son’s daycare they had a Dandiya event last weekend and as part of it, they had asked us to bring Kid-friendly Dandiya Sticks. Knowing how these kids suddenly forget the dancing and start fighting, the regular sticks could be an issue. So the idea given was to use paper for making the dandiya sticks and decorate it without using glitter/stones etc. 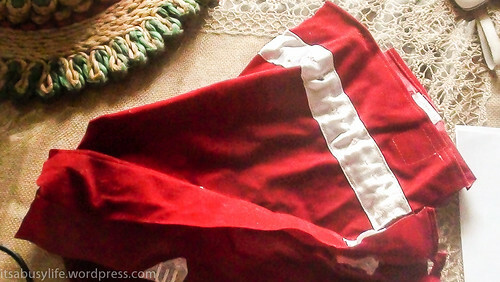 Then I found an old drawstring bag which was made out of velvet cloth – I thought it would be nice to cover the sticks with it. So I cut it and hand-stitched 2 pouches to put as covers for the sticks. Before covering it, I also put a small pencil through each of the foam sticks so that the middle portion would get some stability. 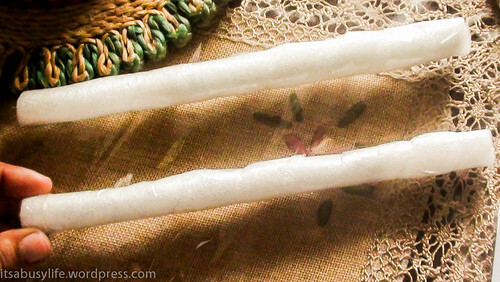 Dandiya sticks ready for decoration! Used some simple lace to decorate along with some regular fabric paint dots – I would have loved to use some kundan stones but as this was not allowed, I did not use it! Here is the final outcome. It was so soft that even if you tried to hurt someone with it, you could not 🙂 ! 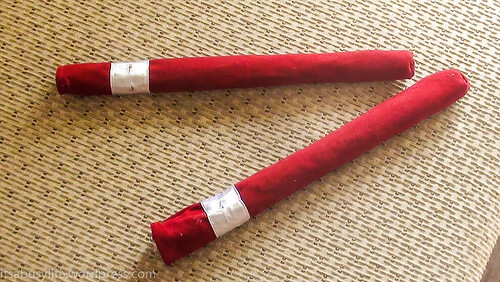 There was a competition for the best dandiya sticks – though we did not win that, I was kind of happy that I made this absolutely kid-friendly and by reusing stuff I had at home. Let me know what you think!